If Israel were to become a majority Muslim Arab state, we can expect such a unitary bi-national (since the minority of Jews will remain substantial) state to be secular and democratic. The Jewish state …. belongs to a tiny group of countries — the United States, Britain, and Canada among them — never to have suffered intervals of non-democratic governance. Since its inception, Israel has been threatened ceaselessly with destruction. Yet it never once succumbed to the wartime pressures that often crush democracies. Israel’s Supreme Court: Liberal bastion or an enforcer of injustice? Rather than curbing systematic rights abuses against Palestinians, [Israel’s three-tiered] justice system reinforces the discriminatory status quo… In other words, the state and the Supreme Court are effectively partners in a strikingly oppressive law that flies in the face of international obligations and Palestinians’ human rights. Some people cite the following as evidence that Israel does not discriminate against any religious group. Michael Smith’s answer to Is Israel a secular state capable of absorbing Palestinians in a one-state solution? In Israel, for example, Sharia law is legal. Jews, Christians, Muslims, etc…all have control over their own civil affairs to a large degree. The inhabitants of the different portions of the Occupied Territories are subject to the jurisdiction of different authorities. Israelis (both Jewish and Arab) living in East Jerusalem fall under Israel’s civil and criminal law system (the Israeli government formally annexed East Jerusalem in 1980, although no other government, including the United States, has recognized this annexation). Palestinian residents (not holding Israeli citizenship) of Jerusalem, are also subject to Israeli civil and criminal law. Israelis living in West Bank settlements are subject to a combination of Israeli civil and criminal law, and military law. Palestinians living in the portion of the West Bank designated as Area C in the Oslo II Accord fall under Israel’s military legal system, while Palestinians who live in Area B fall under PA civil law and Israeli military law for criminal and security issues. Although per the Oslo II Accord, PA civil and security law applies to Palestinians living in Area A of the West Bank, Israel applies Israeli military law whenever its military enters Area A. The Gaza Strip officially comes under the jurisdiction of an interim PA government, although Hamas exercises de facto authority over it. People who advocate for the one-state solution include the words “democratic” and “secular” in the concept. They are clear on what such a state would look like and often make analogies with political transformations in South Africa and Northern Ireland. Ethical decolonization of Palestine is likely to be a lengthy and difficult transition, but it is neither impossible nor necessarily bloody – certainly not on the religious score. Those who have come of age in 1967 and later (i.e., since the military occupation by Israel of the West Bank, Gaza Strip and the Golan Heights) might well believe that religion (Judaism) has always been central to the Zionist Movement, but the fact is that its founders were atheist Jewish nationalists. … after 1967 … we saw the emergence of a kind of Zionist Jewish nationalism in the form we know it today and the reason for that was in order to create a biblical claim for Israel to keep the West Bank and East Jerusalem and other territories. After 1967 we started to see the idea of the West Bank as “Judea and Samaria”, as the cradle of the Jewish people, that Israel had a right to keep based on those biblical claims. And then of course while these Jewish nationalist claims are made, they typically take the form of “our religious claim to this land are the most authentic and the oldest”, so people respond to that and they say. “well wait a minute, our religion is important too,” and so you begin to see Muslims also emphasizing religious claims to Jerusalem and to the land [in religious terms] that were absent in the Palestinian nationalist discourse…. there are traditions in Palestine of all the religions in that area coexisting and that is something that is perfectly plausible in the future as well. While religion is not the defining feature of Palestinian identity, Israeli state discrimination against Palestinians, including Palestinian citizens of Israel, is based on their non-Jewish identity and is therefore a clear religious freedom issue. To suggest that such discrimination is based on citizenship rather than religion or national origin is tautological because, if Palestinians were Jews, they would be entitled to Israeli citizenship as a matter of right under the Law of Return (discussed in chapter 2, infra). In no other country are there streets without buses and tracks without trains on the Sabbath. No other airline but El Al sits idle one day a week. Cold platters on the Sabbath in hospitals and hotels are also something not seen elsewhere. Roads on pillars because of ancient burial sites – a kind of pagan ritual to those on the outside looking in – and the separation in certain buses of men and women are also unknown in democratic countries. Religion has never been separate from the state here; hand in hand they oversee our way of life. The relationship between Israel and religion is far from simple. 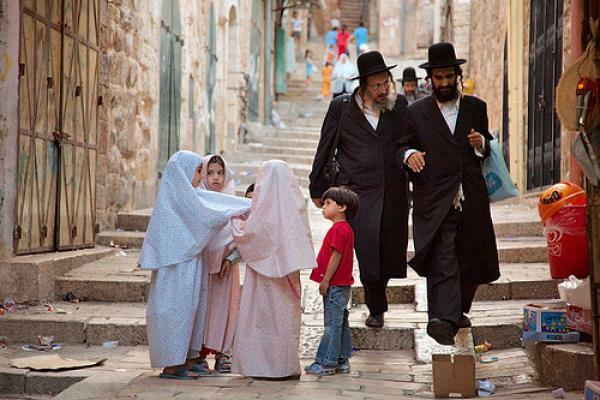 One secular democratic state would allow followers of all religions in historic Palestine to co-exist peacefully again. This is the only possible solution now. The Two State solution is never going to happen.